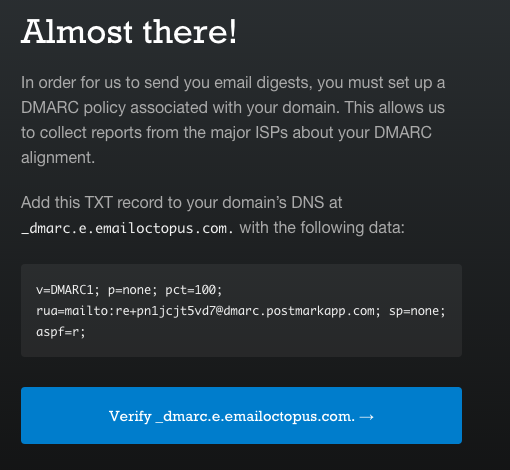 The instructions below are a walkthrough on how to add SPF, DKIM and DMARC to your Amazon SES account (which will then be picked up by EmailOctopus). In this process there will be significant changes made to your DNS settings, we’d advise that you take great care and have sufficient technical knowledge to make these changes. It’s well worth familiarising yourself with how to make DNS changes before starting this guide. We also recommend keeping your DNS tab/window open, throughout the walkthrough. First, we’ll need to log in to the AWS dashboard and navigate to the Amazon SES dashboard. Click on the Verify a New Domain button. Now you should see the following screen with all of the DKIM DNS entries listed (NOTE, your values will be different from the screenshot). Download the CSV containing the DNS records, and open it. You will need to apply the DNS records to your DNS. Instructions on how to do this for a few DNS providers are below. Often the DNS is hosted with the same company as that who provided your domain name. Upon returning to the SES dashboard your domain should be listed as pending. Once Amazon has completed verifying your domain they’ll send you an email notifying you of the success. This should take less than 5 minutes. You will receive an email for both Domain Verification and completed DKIM set-up. Next up, you will need to set-up a custom Mail From domain. 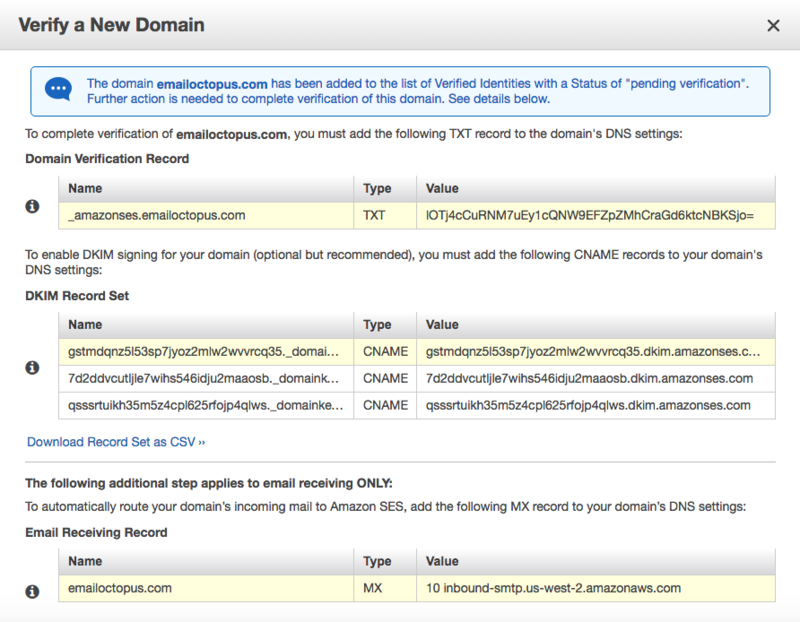 This will allow Amazon SES to mark emails as “coming from” your domain rather than from Amazon. Click on your domain in the SES domain dashboard. Create a new subdomain to use as your MAIL FROM domain. We use e.emailoctopus.com in this example. Once Amazon is able to verify the DNS settings they will send you an email telling you that it has been successfully verified. Go to https://dmarc.postmarkapp.com/ to create your free account. This account will receive the daily ISP reports, which will then be sent to you on a weekly basis. Enter the subdomain, as set-up previously, in the send reports about this domain field. Copy the above DNS records into your DNS providers settings, and save them.